Our SweepZone technology uses "Smart Circuit," a custom-engineered electronic component that creates Constant Power Output (CPO) for consistent, uniform cleaning. This technology incorporates Pulse Width Modulation (PWM), which enables our SweepZone Ag Ultrasonic Cleaning Systems to sense cleaning loads, solution level and voltage fluctuations. What does that mean? 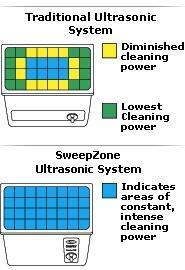 Our SweepZone Ag cleaning systems automatically adjust to different conditions to create uniform cleaning power—eliminating hot spots and weak areas. Timer, pilot light and drain standard. Fan-cooled. Heater optional. Accepts up to six large or 12 small cassettes. Also available in a recessed version (Ag650R). 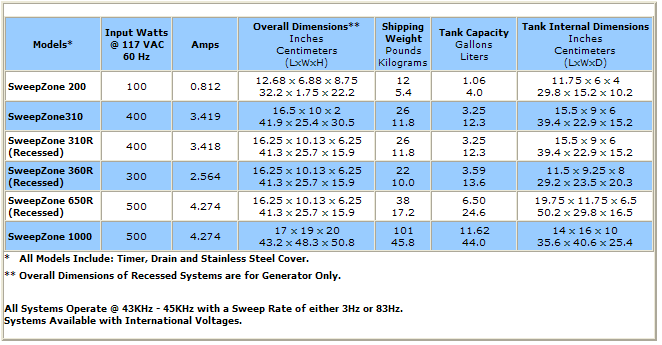 Automatically controlled frequency changes create an ultrasonic cleaning "grid" which literally "sweeps" through the entire tank, unlike the pattern created by traditional ultrasonic systems. The result is total cleaning, which means constant power and consistent output.